A masterful painting. A celebration of species diversity. A promotion of conservation for the Cascade-Siskiyous.... "Butterfly Diversity of the Cascade-Siskiyou" by artist Deb VanPoolen is up for auction Oct. 4th - Oct. 14th, 2017, with the majority of proceeds going toward Cascade-Siskiyou National Monument protection. KSW: How was the idea for this painting conceived? DV: During the summer of 2016 while I was hiking in the mountains of Southern Oregon (near Ashland) with field biologist John Villella I told John I want to make some art promoting the protection of the natural environment. Immediately John shared what he’d been dreaming for years: someone uses his butterfly photographs to make a poster for education about the local biodiversity of butterflies which points to the fact that the Cascade-Siskiyou region is a biodiversity hotspot. Through consultations with John and other lepidopterists (butterfly experts) the final 41 butterflies were chosen for the painting. John suggested I also include fifteen host plants of the butterflies in the painting in order to depict the symbiotic relationships between plants and butterflies. KSW: The painting is enormous, 4 X 8 feet! How did you go about creating it? DV: The pre-painting design process included several steps. In order to include all forty-one butterflies in the artwork, I chose a large format of four feet by eight feet for the original acrylic painting. I chose images of butterflies and plants available via John’s flicker page and the creative commons on the internet. After enlarging the images I then traced them onto a four-foot-by-eight-foot paper sheet and drew the original landscape composition around the butterflies and plants. As I worked through the issues with that composition I did some cutting and pasting to move the butterflies and plants around the piece until everything worked together just right. In order to get the composition onto the gator board, I used a “carbon copy” method. The carbon copy method includes two steps: first, I trace the whole composition onto the backside of the paper the composition is on, adhering the paper to a light board (in this case a sliding glass door) and using a soft pencil so the tracing is made up of dark, thick lines; second, I transfer the drawing onto the primed gator board surface by laying the composition down onto the gator board surface. The large drawn composition was in four chunks of paper that were two foot by four foot each. I traced all of the images onto the front side of the composition using a hard pencil. VanPoolen spent over 3 months of full-time work to create the painting. In the first stages of painting, she begins to color individual species. Once the composition was drawn onto the primed gator board, I experimented with color schemes for the landscape that would complement the butterflies. When I determined the landscape color scheme I then began the dance of painting landscape and butterflies together. Painting the individual butterflies in all of their detail was painstaking and fun at the same time. Each day I marveled at the wonder of the natural world, the existence of such variety and exquisite design. I worked full-time to create the artwork for the butterfly poster throughout the first three months of 2016. I averaged eight to ten hours per day of work on the piece. My sanity was preserved by some welcome ski breaks at Mt. Ashland! KSW: After the completion of the painting, and the use of the image for an educational poster, how has it been received by the public? DV: The beauty of the butterflies and landscape in this poster are so mesmerizing that vast numbers of people who didn’t previously know about this region’s biodiversity are being compelled to purchase the poster, and odds are good that their appreciation of the Cascade-Siskiyous will grow through owning it! KSW: With the recent Trump Administration attacks on National Monuments nationwide, and specific threats to remove protections for the Cascade-Siskiyou, how have the art and poster become 'tools for conservation?" The educational poster includes keys for the butterfly species and their plant host species. Now available for sale. DV: Well, I've been displaying the painting and selling the poster each week at the local artisans' market in Ashland. It's the closest city to the Monument. I've been telling interested folks that the Cascade-Siskiyou National Monument remains the only public land nationwide designated based on the need to protect biodiversity. Now, with the administration of the 45th president of the USA saying they want to reduce the monuments boundaries, we need to make sure to preserve the current boundaries of the Cascade-Siskiyou National Monument! As we have seen in other instances with this administration, science doesn’t matter much. Thus, strong grassroots support is needed to speak up for the dire necessity of the monument to keep its current borders. 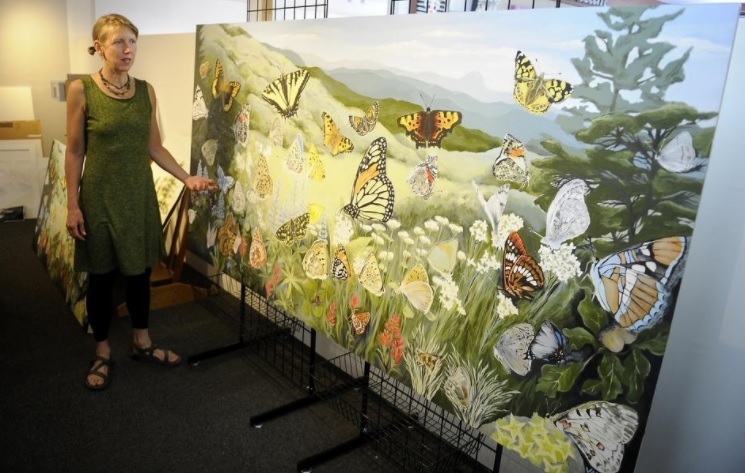 I am raising money for the defense of the Cascade-Siskiyou National Monument--as is--through auctioning off the original, four-foot-by-eight-foot painting of the butterflies. KSW: Is the poster still available for purchase? How can folks bid on the original butterfly painting? DV: Yes, please buy one or several butterfly posters which help spread the awareness of the butterfly diversity in the Cascade-Siskiyous! Bid for a change to win the original butterfly painting! Proceeds from this sale will directly support the litigation efforts to ensure the Cascade-Siskiyou National Monument remains intact. Auction available Oct. 4th - Oct. 14th, 2017. The finished painting, "Butterfly Diversity of the Cascade-Siskiyou" is now up for auction! Proceeds will go to KS Wild for the protection of the Cascade-Siskiyou National Monument.